If the earthquakes cannot be stopped, the entire world will be threatened by destruction, and the Brungarian forces will conquer the earth. How Tom utilizes all his scientific knowledge to produce swift-action results and outwit the Brungarians makes one of the most exciting Tom Sift adventures to date. There are two main inventions in this book -- Exman (which Chow calls the "Ole Think Box") and Tom's Quakelizor. Because Exman comes into the picture first, I'll deal with him first. 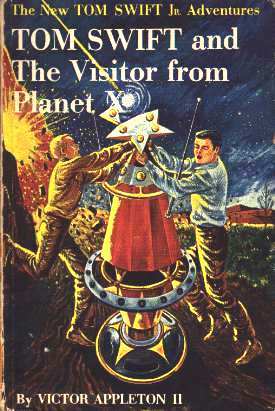 When the story opens up, the reader finds out that Tom's space friends want to send him some "brain energy" in hopes that the brain energy can gather enough information about Earth to enable them to come and visit that planet. Tom, then, must build a body to receive this mysterious brain energy, and he does so. When the brain energy arrives, Tom christens the mechanical man and its brain energy as Exman. To me, it is disappointing that Exman doesn't reveal any scientific secrets to Tom -- when I read the book, I was hoping that he would give him the blueprints to some fantastic device. I was also hoping that Exman might have a long conversation with Tom about life on his home planet, perhaps telling him some details of cities and things. Exman, however, doesn't do any of these things, and spends the majority of his time on Earth spying on rebel Brungarians. You know, it's kind of strange that Tom never does meet with the space aliens. I would think that Exman would finally have given the space people the information they needed to come to Earth -- or if not Exman, then surely the secret data cache that Tom unearthed in Tom Swift and his Subocean Geotron would do the trick. But even if they were never able to penetrate the atmosphere, why didn't they meet Tom in space? Many times throughout the series Tom's space friends sent him samples of life on other planets. Why couldn't they go and meet him, say, on Nestria or on the Moon? For that matter, when Tom had perfected his Cosmotron Express, why didn't he stop by at his space friend's planet and pay them a visit? There was the perfect chance, and he let it go by. What a shame. Tom wondered if the brain energy would be able to perform actions by itself, given the proper mechanical output devices. Or would he have to help it function via an electronic computer to digest incoming information or stimuli and then to respond through servo controls? The problem was so baffling and complex that Tom became completely oblivious to the passage of time. He sketched out plan after plan, only to crumple and discard each one. Although both the problem and the solution were still hazy in his mind, a few ideas began to take shape. A radio antenna would certainly be needed, to receive or transmit signals at a distance. And repelatron units would give the brain a way to exert force when it wanted to act. These were devices that Tom had invented to produce a repulsion-force ray. He had used the principle in both air and space flight. A power plant might also be needed to generate additional energy in case the brain's own energy was very small. Lastly, there would have to be a control system for use either by the brain itself or by its human operators. The device stood about shoulder-high, with a star-shaped head, one point of which could be opened. The head would contain the actual brain energy. Its upper body, cylindrical in shape and of gleaming chrome, housed the output units through which the brain would react, and also the controls. Antennas projecting out on either side gave the look of arms. Its "waist" was girdled with a ring of repelatron radiators for exerting a repulsion force when it wanted to move, by repelling itself away from nearby objects. Below, the repelatrons as an hourglass-shaped power unit, housing a solar-charged battery. The power unit, in turn, was mounted on a pancake-shaped transportation unit. This unit was equipped with both casters and a sort of caterpillar-crawler arrangement for the contrivance to get about over obstacles. Inside was a gyrostabilizer to keep the whole device upright. How feasible is it to build an Exman/how much impact would an Exman have on civilization? I think that another question would be more appropriate: why in the world would you want to build an Exman? If you had the right pieces, mere assembly wouldn't be too hard. However, without the controlling brain energy the whole experiment is useless, because the brain energy controls the whole machine. Now, if you wanted to build your own brain energy and your own Exman (as Tom kind of did in Tom Swift and his Giant Robot), you start getting into the field of cybernetics and artificial intelligence and immediately run into massive problems. Building a mechanical man is no mean feat. Your body, in case you hadn't noticed, is a very finely tuned and sensitive instrument and really puts to shame any machine that has ever been built. The brain alone is nearly incomprehensible, and making a mechanical duplication, as experts will tell you, is very close to an exercise in futility. So, in short, it isn't possible -- not by a long shot. The other invention in this book is the Quakelizor. The Quakelizor was invented by the request of the United States Government. It seems that the Brungarians had created several massive machines that, when used in harmony, can generate massive earthquakes anywhere on the globe. 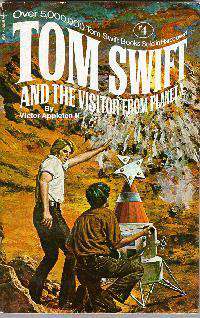 As the Brungarians had started using the machines to reduce American defense factories to rubble, the Government desperately went to Tom Swift and asked that he come up with a defense. Tom, then, obliged and created a device called a Quakelizor. The Quakelizor works by simply detecting any incoming waves and sending out a new wave that "cancels out" the Brungarian's wave. Equipped with several of these put at strategic points throughout America, Tom was able to put a stop to the Brungarian's earthquakes. Tom got up from his stool and paced about the laboratory. "Suppose the Brungarian rebel scientists have invented some sort of shock-wave producer--a device for sending vibrations through the earth's crust or the mantle underneath." "Okay, suppose they have," Bud replied. Tom snatched up a piece of chalk and made some quick diagrams on a blackboard. "Just this, pal. Let's say they set up two or three stations around the world for sending out such waves in a definite direction. Wherever the wave crosses an earth fault or another wave--boom! An earthquake!" Bud stared. "No kidding, is that how those rats triggered off all these quakes?" "It must be," Tom declared. "It's the only possible explanation." "Good night!" Bud gasped weakly. "What a weapon! Just push a button every so often and you could blow up another country bit by bit--and no one could ever prove who was behind the attack!" "I'd say your theory is right, Tom, about the quakes being produced by artificial shock wavesÖbut how do we stop them?" "I believe they can be damped out by opposing waves," Tom replied. "This is assuming that I can design the right sort of equipment to do the job--and also that we can set up a warning system to alert us of the enemy shock waves in time." After a thorough discussion, it was agreed that the Defense Department would set up detectors at fifty checkpoints around the country. Tom would choose the exact spots. Detection data from the checkpoints would be fed to an electronic computer. The computer would establish the pattern, if any, of incoming enemy shock waves. "Hank, you did a fast job on the container for the brain," Tom began apologetically, "but you'll really have to burn out a bearing on this one!" Hank grinned. "I'm geared to action. Say, what do we call it, anyhow?" he asked. Tom grinned. "Chow told me last night this gadget looked like a fireplug under a rose trellis and I ought to call it Fireplug Rose! But I've given it a more dignified name--the Quakelizor, which stands for an underground quake wave deflector. 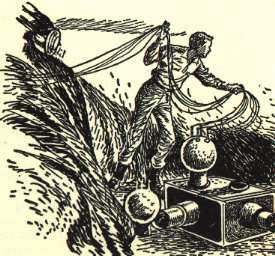 Briefly, Tom explained the various parts of his latest invention, which consisted of a hydrant-sized cylinder to be inserted into the ground, with magnetic coils near the top. A smaller hydraulic cylinder, mounted above this, was wired to a metal framework and radio transmitter. "This setup will detect any incoming enemy shock waves," Tom said. "We'll need fifty of 'em, so turn the job over to Swift Construction. And have Uncle Ned put on extra shifts." The Swift Construction Company, managed by Ned Newton, was the commercial division which mass-produced Tom Jr.'s and Tom Sr.'s inventions. Information from the detector-transmitters, Tom went on, would be fed into an electronic computer at the Bureau of Mines in Washington. The Quakelizor itself was housed in a massive cube-shaped casting with two large spheres mounted on top. From each of its four sides jutted a hydraulic piston. "How does it work, Tom?" Hank asked. "Dual-control spheres on top," Tom explained, "will receive by radio signal the pulse frequency computed in Washington"
The pressure changes would then be enormously magnified in the four hydraulic output drivers. When the unit was embedded in rock, underground, the huge pistons would send out counter shock waves through the earth's crust to neutralize the enemy waves. How feasible is it to build a Quakelizor? In my opinion it would be very, very difficult. How in the world do you create vibrations in the earth's crust strong enough to span the globe? Moreover, how do you create a signal strong enough to counteract those vibrations? It seems to me that the job would be a very, very hard one. It seems to me, though, that this really isn't a great loss. Tom built the Quakelizor for one purpose, and it was used to fulfill that purpose. The machine, I'm afraid, is specially built to halt artificial earthquakes, and there really isn't anything else that it can be used for. Mr. Swift arrived at the laboratory an hour or so later. He found Tom setting up an experiment with a glass sphere to which were affixed six powerful electromagnets. Two shiny electrodes, with cables attached to their outer ends, had also been molded into the glass. Bud was looking on, wide-eyed. Tom explained to his father that he had blown the sphere himself, following a formula adapted from the quartz glass used for view panels in his space and undersea craft. "What's it for, son?" Mr. Swift asked, after studying the setup curiously. "Don't laugh, Dad, but I'm trying to produce a brain of pure energy. A substitute for Exman, so we can go ahead with our sensing experiments." Mr. Swift reacted with keen interest and offered to help. "But remember, son," he cautioned, "at best you can only hope to produce an ersatz brain energy -- which will be vastly different from the real thing. Don't forget, Tom, the mind of a human being or any thinking inhabitant of our universe is based no a divine soul. No scientist must ever delude himself into thinking he can copy the work of our Creator." "I know that, Dad," Tom said soberly. "Man's work will always be a crude groping, compared to the miracles of Nature. All I'm hoping to come up with here is a sort of stimulus-response unit that we can use for testing any sensing apparatus we devise."